Due to all of the differences in basal resources, productivity, and habitat conditions that are associated with stream location and position along the river continuum, it is apparent that food web structure will change with landscape position (Woodward and Hildrew 2002a). Landscape features determine the stream ecosystem's physical setting including flow regime and habitat features, influence the relative importance of basal resources, affect the magnitude of external subsidies of nutrients, detritus, and prey, and vary from place to place, conveying a high degree of individuality to the species assemblage and food web structure at each locale (Woodward and Hildrew 2002a). 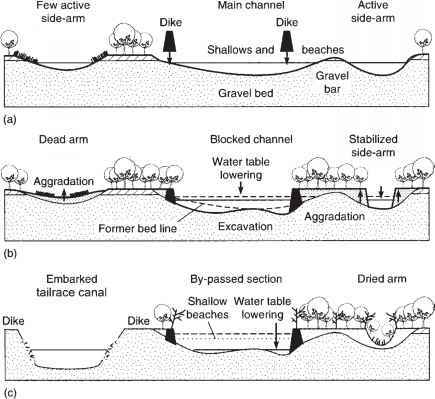 Models of stream ecology, particularly the river continuum concept (Figure 1.7), attempt to explain changes in the structure and function of stream communities within the context of the landscape, including longitudinal patterns and shifts in energy inputs between forested and open sites (Vannote et al. 1980). The influence of the riparian corridor on basal resources is well known, especially in small streams where the extent of summer shade and autumn leaf fall acts as a switch between allochthony and autochthony. Linkages between aquatic and terrestrial food webs associated with consumer trophic levels can be surprisingly strong, as illustrated by the reciprocal subsidies of insects between streams and riparian zones. The strength of trout-induced trophic cascades can depend on the supply of terrestrial invertebrates (Nakano et al. 1999). Even the frequency of pollinator visits to riparian plants can be affected by fish predation on larval odonates, which determines the abundance of adult dra-gonflies and hence predation pressure on pollinating insects (Knight et al. 2005). In addition to the location-specific influence of landscape setting on the supply of energy and nutrients, and the interactions among species within stream communities, physical and biological processes serve as links between adjacent and distant locations. Downstream transport of nutrients and organic matter by river flow and lateral exchanges with the floodplain during seasonal inundation are the dominant physical processes. Long-distance fish migrations by Pacific salmon import quantities of marine-derived C and nutrients from the oceans into headwater streams, providing nourishment to aquatic and terrestrial consumers and fertilizing the growth of riparian vegetation (Willson and Halupka 1995). Prochilodontid fishes of South America make seasonal spawning migrations of hundreds of kilometers from flood-plains to upland rivers where they are consumed by apex predators (Winemiller and Jepsen 1998). Migratory fishes may be simply the most apparent example of the way that movements of organisms connect distant ecosystems. Through dispersal, movements among habitats, and occasional displacement, many fishes both as individuals and populations are functionally connected across scales from reach to river basin (Fausch et al. 2002).